Traffic is moving freely again in Santee where crews worked on a water main break Friday morning. 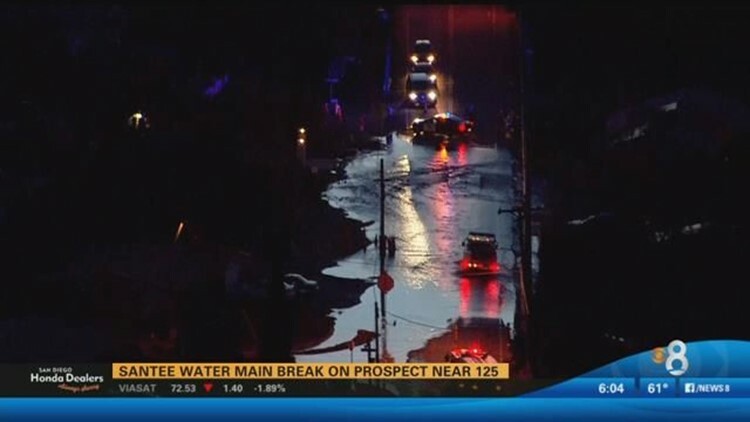 SAN DIEGO (CBS 8) - Traffic is moving freely again in Santee where crews worked on a water main break Friday morning. It happened around 6 p.m. Thursday in the 8800 block of Prospect Avenue near the 125. Thousands of gallons of water gushed into the street. Work crews dug a big hole in the road and fixed the broken pipe, then patched the street. Water service has been restored for about 40 homes.